The Office of Inspector General of the Department of Health and Human Services (OIG-DHHS) issued a report which showed explosive growth and also raised questions of lack of medical necessity and/or indications for facet joint injection services in 2006. The purpose of the study was to determine trends of frequency and cost of facet joint interventions in managing spinal pain. Medicare and Medicaid Services (CMS) for 1997, 2002, and 2006. Outcome measures included overall characteristics of Medicare beneficiaries receiving facet joint interventions, utilization of facet joint interventions by place of service, by specialty, reimbursement characteristics, and other variables. Medicare population increased 386%, facet joint visits increased 446%, and facet joint interventions increased 543%. The increases were higher in patients aged less than 65 years compared to those 65 or older with patients increasing 504% vs. 355%, visits increasing 587% vs. 404%, and services increasing 683% vs. 498%. Total expenditures for facet joint interventions in the Medicare population increased from over $229 million in 2002 to over $511 million in 2006, with an overall increase of 123%. In 2006, there was a 26.8-fold difference in utilization of facet joint intervention services in Florida compared to the state with the lowest utilization - Hawaii. There was an annual increase of 277.3% in the utilization of facet joint interventions by general physicians, whereas a 99.5% annual increase was seen for nurse practitioners (NPs) and certified registered nurse anesthetists (CRNAs) from 2002 to 2006. Further, in Florida, 47% of facet joint interventions were performed by general physicians. The reported explosive growth of facet joint interventions in managing spinal pain in certain regions and by certain specialties may result in increased regulations and scrutiny with reduced access. The Office of Inspector General (OIG)of the Department of Health and Human Services (OIG-DHHS), issued a report in September 2008  noting that Medicare paid over $2 billion in 2006 for interventional pain management (IPM) procedures. This report also showed that Medicare payments for facet joint injections increased from $141 million in 2003 to $307 million in 2006. Of concern, 63% of facet joint injection services allowed by Medicare in 2006 did not meet the Centers for Medicare and Medicaid Services (CMS) program requirements, resulting in approximately $129 million in improper payments. This report illustrated that facet joint injection services provided in an office were more likely to have an error than those provided in an ambulatory surgery center (ASC) or hospital outpatient department (HOPD). The OIG report also illustrated that approximately 35% of the Medicare facet joint injections were performed by non-interventional pain physicians. The OIG report recommended some radical changes in monitoring utilization of interventional techniques. Further, independent investigators also have shown an exponential increase in the performance of facet joint interventions [2–5]. Friedly et al [3, 6] reviewed trends in injection procedures focusing mainly on epidural injections from 1994 to 2001. Manchikanti et al  analyzed the growth of all interventional techniques in managing chronic pain in Medicare beneficiaries from 1997 to 2006. Both investigators demonstrated an overall increase of interventional techniques in all settings and in all parts of the country. The increase in the number of patients receiving IPM services per 100,000 of Medicare recipients was 137% with an overall increase of IPM services of 197% per 100,000 Medicare beneficiaries increasing by 197%. However, the most dramatic increase was found to be for facet joint interventions with a 543% increase per 100,000 Medicare beneficiaries. Chronic spinal pain in the United States is highly prevalent with substantial economic impact [7–16]. However, the treatment of spinal pain is controversial, in part related to the wide variability in the treatments utilized . The rising prevalence of chronic low back pain has been demonstrated with continued high levels of disability and health care use . 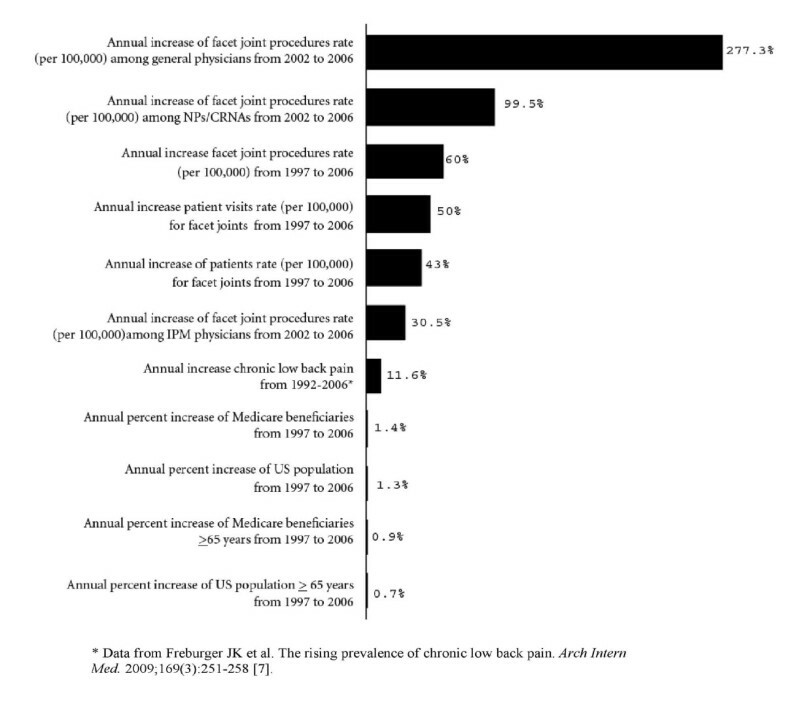 Freburger et al  showed an annual increase of 11.6% of chronic low back pain and attributed a substantial portion of rising low back pain care costs over the past 2 decades to this rising prevalence. Chronic spinal pain is associated with functional and psychological disabilities and health, social, and economic impact, especially in the elderly [10–13, 17, 18]. Epidural injections and facet joint interventions are the 2 most commonly utilized procedures in IPM [1–6, 19, 20]. However, the literature addressing the effectiveness of facet joint interventions, though emerging, is highly variable, based on the technique, outcome measures, patient selection, and methodology [21–28]. Health care spending in the United States is escalating and the long-range fiscal sustainability of Medicare is in question [26–29]. In a report titled Accounting for the Cost of US Health Care: A New Look at Why Americans Spend More  it was found that in 2006 the United States spent $650 billion more on health care than any of its peer Organisation for Economic Co-operation and Development (OECD) countries, even after adjusting for wealth. The majority of the excess spending was derived from outpatient care. One of the means of controlling health care expenditures is by ensuring that all care is medically necessary and avoiding overuse, abuse, and fraud. The OIG report suggests that there is significant overuse, abuse, and potential fraud in performing facet joint interventions in the United States. In this study, we sought to evaluate the use of all types of facet joint interventions (i.e., intraarticular injections, facet joint nerve blocks, and facet joint neurotomy) in the lumbar, cervical, and thoracic spine. In addition, our purpose was to identify trends in the number of procedures, reimbursement, specialty involvement, fluoroscopy use, and indications. Finally, we sought to explore the association between overall injection costs and the volume of services provided in HOPD settings, ACSs, and in-office settings. The data for this study was used from the standard 5% national sample of the CMS physician outpatient billing claims for 1997, 2002, and 2006. The data set is a sample of those enrolled in the fee-for-service Medicare program based on selecting records with specific numbers in positions 8 and 9 of the health insurance claim number and is generated by CMS. The CMS 5% sample data set is therefore unbiased and unpredictable in terms of any patient characteristics, but does allow appropriate tracking of patients over time and across databases. Consequently, CMS makes this 5% sample available to researchers. In addition, a 100% data set is so large that it is not feasible to use for research purposes. Thus, Institutional Review Board (IRB) approval was not required. CMS's providing the data also does not require IRB approval prior to analysis or publication. Previous studies [3, 6] generally included patients aged 65 and older. We have studied all patients enrolled in Medicare who received interventional techniques . Overall Medicare enrolled over 43 million beneficiaries in 2006, and is the single largest health care payor in the United States . Consequently, the Medicare data set includes a large proportion of procedures for spinal pain being performed in the United States, including facet joint interventions. In addition to patient age, the database included the Current Procedural Terminology (CPT) procedure codes; the International Classification of Diseases, 9th Revision, Clinical Modification (ICD-9-CM) diagnosis codes; date of service, provider specialty, provider zip code, and allowed charges. To yield data for the entire beneficiary population of Medicare, results from the 5% sample were multiplied by 20. In addition, rates were calculated based on Medicare beneficiaries for the corresponding year and are reported as per 100,000 Medicare beneficiaries. The data were tabulated based on the place of service - HOPD, ASC, or office for the years 1997, 2002, and 2006. Facility charges were also identified for HOPDs, ASCs, and offices (office facility portion as overhead expense equals total office payment minus physician payment). Facility payments for HOPD were estimated based on national payment rates with consideration of modifiers, due to the non-availability of HOPD data in the data set. Allowed charges were used to estimate the costs of Medicare for these procedures and costs were adjusted for health care inflation using the U.S. Bureau of Labor Statistics Consumer Price Index (CPI) for medical care services and represent costs for 2006 . In this study, all types of facet joint interventions with CPT codes 64470, 64472, 64475, 64476, 64622, 64623, 64626, and 64627, with evaluation of Medicare data of 1997, 2002, and 2006 were utilized. Appropriate considerations were given to the changes in the CPT with introduction of new codes or replacement codes. In addition, diagnostic codes were utilized from the ICD-9-CM. The previous studies excluded cervical and thoracic facet joint interventions [3, 6]; they argued that cervical and thoracic spine disorders differ clinically from lumbar spine disorders and may be the result of different disease processes. They believed that cervical and thoracic interventions represent a very small proportion of patients. However, the emerging statistics show that cervical and thoracic facet joint interventions occupy a large proportion of facet joint interventions. Thus, it was felt essential to include these interventions. To analyze the data based on specialty, the IPM specialties were described as those providers designated in IPM -09, pain medicine -72, anesthesiology -05, physical medicine and rehabilitation -25, neurology -13, psychiatry -26, orthopedic surgery -20, and neurosurgery -14 . General practitioners -01, family practitioners -08, and internists -11 were considered as general physicians. All other providers were considered as other physicians and providers. The data were analyzed using SPSS (9.0) statistical software, Microsoft Access 2003, and Microsoft Excel (2003). The procedure rates were calculated per 100,000 Medicare beneficiaries. Table 1 illustrates the characteristics of Medicare beneficiaries and facet joint interventions. During the same period, Medicare recipients receiving facet joint interventions increased 386%. Facet joint interventions increased from 606 per 100,000 in 1997 to 3,895 per 100,000 in 2006, a 543% increase. Characteristics of Medicare beneficiaries and facet joint interventions. The results illustrate a higher proportion of increase for patients under 65; that proportion of patients increased 504% vs. 355%. For those 65 or over, visits increased 404% versus 587% for those under 65; services for those over 65 increased 498% versus 683% for those under 65. The Medicare population below the age of 65 years increased 45.4% in contrast to 8% of those 65 years or older. Table 2 illustrates the summary of frequency of utilization of facet joint interventions based on CPT code and place of service. Due to the 1997 data being non-comparable and not comprehensive, the data from 2002 and 2006 were utilized. The majority of the procedures (80% in 2002 and 77% in 2006) were performed in the lumbar region, with cervical and thoracic procedures constituting 20% in 2002 and 23% in 2006. The most commonly performed procedure was subsequent lumbar facet joint injection/nerve block (CPT 64476). Cervical/thoracic interventions increased 194% per 100,000 Medicare beneficiaries, whereas lumbar procedures increased 151%. In 2002, 40% of procedures were performed in HOPD settings and 41.7% in office settings; whereas in 2006, 59.6% were performed in office settings. The overall rate (per 100,000 Medicare beneficiaries) increased by 160% from 2002 to 2006; whereas in office settings the rate increased significantly (271%), followed by ASCs (168%) and HOPD settings (40%). Cervical procedures increased 194% with a distribution of 259%, 224%, and 59% in office, ASC, and HOPD settings. Utilization of facet joint interventions by place of service. Additional file 1 illustrates physician and facility reimbursement by place of service adjusted for inflation for years 2002 and 2006. As seen in Additional file 1, overall facility average charges decreased by 26%. Figure 1 illustrates the increase in utilization of facet joint interventions by various specialty groups assigned as IPM, general practice, NPs/CRNAs, and others from 2002 to 2006. Across the country, the majority of procedures were performed by IPM physicians with 87% in 2002 and 74.5% in 2006. However, in 2006 general physicians performed 18.6% of these procedures, while all others performed 6.9% of the procedures (Table 3). Overall increases were greatest for general physicians, increasing by over 1,109% from 2002 to 2006, an annual growth of 277.3%. There was also an increase of 398% from 2002 to 2006 among NPs and CRNAs, an annual increase of 99.5%. In Florida in 2006, 47% of the procedures were performed by general physicians with specialties of general practice, family practice, and internal medicine. Annual percentage of increase of facet joint intervention services per 100,000 Medicare recipients from 2002 to 2006. Utilization of facet joint interventions by speciality. Figure 2 illustrates fluoroscopy utilization based on specialty. 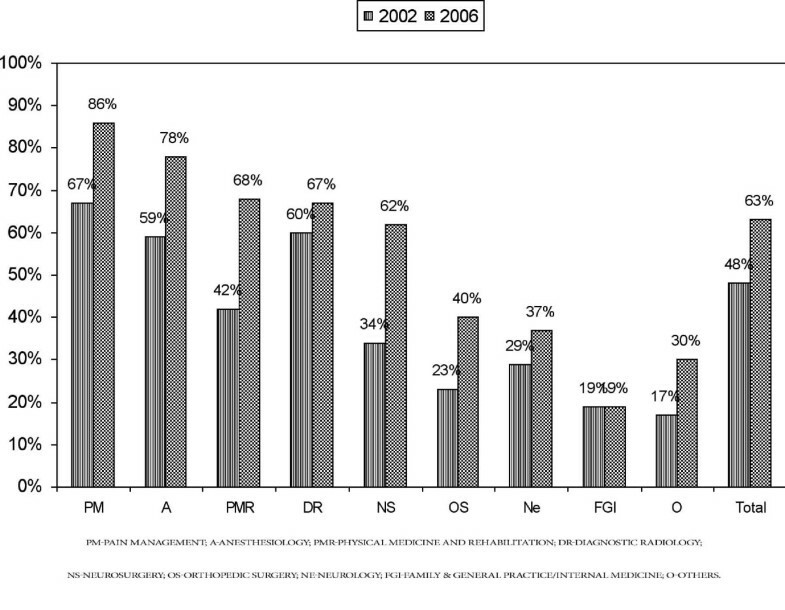 Overall in 2002, 48% of all visits included fluoroscopy, compared to 63% visits of all visits in 2006. Percentage of visits utilizing fluoroscopy based on specialty. Table 4 illustrates facet joint interventions for each state. South Dakota showed the highest increase of 504% with Alabama showing the lowest increase of 14% per 100,000 Medicare beneficiaries. The overall increase for the United States was 160% from 2002 to 2006. However, smaller states with a small number of procedures, such as South Dakota, preclude any conclusions to be drawn as per the increases. Thus, when normalized for population, Florida showed a 26.8-fold difference from Hawaii, the state with the lowest, for 2006. All other states showed a difference of less than 10-fold with Michigan showing a 9.87-fold difference, Texas showing an 8.42-fold difference, Arkansas showing a 7.34-fold difference, and Delaware showing a 6.47-fold difference, compared to the lowest state for 2006. Further, facet joint procedures per state as a proportion of national utilization declined in multiple states. Number of facet joint interventions and procedures per 100,000 Medicare beneficiaries provided by state. Table 5 illustrates the utilization of ICD-9-CM diagnostic codes for facet joint interventions. The most common diagnoses documented were "lumbosacral spondylosis" in the lumbar spine of 32.3% and cervical spondylosis in the cervical spine of 5.3%. Degenerative disc disease was the diagnosis criteria utilized in 6.2% and 1.2% of cases in the lumbar and cervical spine respectively. Thus, accurate diagnosis was utilized in fewer than 50% of patients in 2006. Line of diagnosis for facet joint interventions. Figure 3 illustrates the overall growth pattern of facet joint interventions. These annual rates of increase for facet joint interventions represent the years from 1997 to 2006. There was an increase of facet joint interventions by general physicians of over 1,109%. Illustration of overall annual growth patterns. Facet joint intervention rates for spinal disorders increased dramatically over the study period from 1997 to 2006. This increase per 100,000 Medicare population from 1997 to 2006 was relatively constant over time, resulting in an increase of facet joint patients of 386%, facet joint visits of 446%, and facet joint interventions of 543%. Facet joint interventions also increased based on age. Among Medicare recipients per 100,000, less than 65 years of age, compared to those 65 or older, the patient population receiving facet joint interventions increased 504% vs. 355%, visits increased 587% compared to 404%, and services increased 683% compared to 498%. In addition, total expenditures also increased from over $229 million in 2002 to over $511 million in 2006, with an overall increase of 123% from 2002 to 2006. There was a significant increase of 1,109% in the utilization of facet joint interventions by general physicians -- composed of general practice, family practice, and internal medicine -- from 2002 to 2006, an annual increase of 277.3%. There were also significant usage or utilization increases among NPs and CRNAs from 2002 to 2006 of 398%, an annual increase of 99.5%. These increases were substantially higher than any other specialty, even though overall increases were significant: 160% from 2002 to 2006, an annual increase of 40%. There was a 26.8-fold difference in the utilization pattern in Florida from Hawaii, the state with the lowest pattern for 2006. The remaining 49 states showed less than a 10-fold difference. Further, it has been shown that 47% of facet joint interventions in Florida were performed by general physicians. There has been an exponential growth of facet joint interventions in office settings of 271% with ASC settings showing 168% growth and HOPD settings showing 40% growth. However, moving the procedures to hospital settings will not resolve the issue as the average cost of the total procedure in HOPD settings in 2006 was $467.80, whereas in in-office settings, it was $227.60 and in ASC settings, it was $352.20. Fluoroscopy utilization was lowest among family and general practice and internal medicine physicians and highest among pain management specialties. Non-fluoroscopically guided procedures present multiple issues regarding the accuracy of the procedure, medical necessity, and documentation. With respect to evidence for facet joint interventions, there is emerging evidence to show the effectiveness of medial branch blocks and radiofrequency neurotomy along with effective diagnosis, when patients are selected appropriately meeting indications and medical necessity criteria [20–28]. While this evidence is emerging, some systematic reviews  have not utilized these trials [26–28] in their evidence synthesis. Friedly et al  postulated that there was a disproportionate increase in procedures in ACSs, and that ACSs received higher payments. The implication is that these procedures had been shifted to ACSs as self referrals. Also that there was excessive use by facilitating physician investors to increase practice revenues by receiving facility payments for procedures. However, our study shows that this is not an issue. Rather, it may be due to the providing of more efficient services as a result of specialized staff and equipment, and convenient locations with short waiting times as well as better physician production. Further, the data illustrates that the procedures are more expensive in HOPD settings compared to ASC settings. Based on the current data, it appears that the annual increase in the population with chronic low back pain is 11.6% , and the increase in facet joint intervention visits is approximately 50%. The increases are much lower in states with stricter regulations and LCDs [34, 35]. Kentucky showed an annual increase of 25% and Indiana, 26%; whereas the annual increase in Florida was 95%. The overall increase across the country was 40% from 2002 to 2006. McKinsey Global Institute  postulated multiple factors for the increased growth of outpatient health care services in the United States. First, provider capacity growth and response to high outpatient margins is illustrated in this study based on significant increases in in-office settings and also performing these procedures. Other causes are that in outpatient settings, more efficient services are provided as a result of specialized staff and equipment, convenience of the location, short waiting times, and better physician production [34, 35]. The second factor relates to judgment based on the nature of physician care. Over the years there has been significant growth in interventional pain management due to increased understanding and to the availability of a supply of physicians. The third factor described relates to technological innovation that drives prices higher rather than lower , which is not proven in this study in the Medicare population in the United States. The fourth factor relates to demand growth that appears to be due to the greater availability of supplies. While this is accurate, there is also demand due to access and also to the increasing prevalence of spinal pain. The final factor relates to relatively price-insensitive patients with limited out-of-pocket costs. This factor may be realistic in the overall health care evaluation. However, in the Medicare population, the application of this is minimal. In this study we included only the patients who were paying fee-for-service. Thus, price insensitivity does not apply. However, the study of the patients with third party insurance with low out-of-pocket costs and workers' compensation patients with no out-of-pocket costs and Medicare Advantage patients with low out-of-pocket costs or no out-of-pocket costs will illustrate these differences. Yet numerous problems continue to exist with overuse and abuse. There are multiple limitations to our study. These include the lack of inclusion of participants in Medicare Advantage plans, which includes approximately 10% of enrollees, and potential coding errors [3, 31]. However, we have included all patients over 65 receiving traditional fee-for-service Medicare and under 65 as well. This inclusion is important because patients below the age of 65 represent a significant proportion of patients receiving facet joint interventions, with a higher frequency of services. In general, patients less than 65 years of age received more intense and a higher proportion of services (504% vs. 355%) . This fact is echoed in this evaluation, which shows an increase of facet joint services of 683% vs. 498% from 1997 to 2006. Since the data does not contain HOPD facility charges, we had to estimate the facility charges for outpatient hospital charges, similar to Friedly et al . Another limitation is that some variation may be related to coding errors and diagnostic ambiguity, and to non-reporting of fluoroscopy. However, due to the usage of actual data for physicians, ASCs, and office services, these errors should have very little influence. Multiple recommendations have been made to slow the growth of health care costs in general and for interventional techniques in particular [1, 4, 36]. Health care experts have recommended policies that encourage high-growth or high-cost regions to behave more like slow-growth, low-cost regions and to encourage low-cost, slow-growth regions to sustain their current needs for interventional techniques to slow spending growth. The OIG  has recommended strengthening program efforts to prevent improper payments; others  have also recommended more stringent regulations on medical necessity, indications, accreditation provisions in the settings performed, and training and qualifications of the physicians performing the procedures. In conclusion, our data summarizes the explosive growth of facet joint interventions in agreement with the OIG report  and other reports . This review also demonstrates that the growth has been substantial in certain regions and by certain specialties. Some of the growth may be accounted for by improved access, precision of diagnostic and therapeutic modalities outcomes, and the increasing prevalence of spinal pain. However, there still continue to be multiple problems with ambiguity of diagnosis, lack of fluoroscopic use, disproportionate increase in procedures by some specialties and some regions, and escalating costs. The authors wish to thank Sekar Edem for his assistance in the literature search and Tonie M. Hatton and Diane E. Neihoff, transcriptionists, for their assistance in the preparation of this manuscript. Dr. Manchikant is CEO and Chairman of American Society of Interventional Pain Physician representing interventional pain physicians across the nation; is Medical Director of the Pain Management Center of Paducah, the Ambulatory Surgery Center of Paducah, and Pain Care Surgery, providing interventional pain management services including facet joint interventions in an ambulatory surgery center and in an office setting; and is Associate Professor of Anesthesiology at The University of Louisville. Mr. Pampati is a statistician and employed by Pain Management Center of Paducah. He is a non-physician and does not performing interventional techniques; however, he is involved extensively in statistical management of data related to interventional pain management. Dr. Singh is Medical Director of the Pain Diagnostic Associates, Niagara, Wisconsin. He is an interventional pain management physician practicing in an ambulatory surgery center and in hospital outpatient departments including facet joint interventions. Dr. Boswell is a Professor of Anesthesiology and Director of the International Pain Center, Texas Tech University Health Sciences Center, Lubbock, Texas. He practicing interventional pain management including Interventional techniques in all 3 settings; in hospital, hospital outpatient, and in-office settings. Dr. Smith is an Associate Professor and Academic Director of Pain Management for Albany Medical College Department of Anesthesiology, Albany, New York. He practices interventional pain management including interventional techniques in hospital outpatient department setting. Dr. Hirsch is Chief of Minimally Invasive Spine Surgery with the Departments of Radiology and Neurosurgery, Massachusetts General Hospital; and an Associate Professor of Radiology, Harvard Medical School, Boston, Massachusetts. His practice also includes interventional radiology including interventional procedures, but does not include facet joint interventions. LM, VP, VS, MVB, HSS, and JAH conceived the concept, design and coordination. VP processed the data. LM, VS, and MVB drafted the manuscript. HSS and JAH participated in the revision of the manuscript. All authors read and approved the final manuscript.